As Carnegie Hall’s 2014-2015 Perspectives artist, violinist Anne-Sophie Mutter curates a six-concert, season-long series exemplifying her commitment to the future of classical music and highlighting her long-standing relationships with some of today’s greatest conductors, soloists and orchestras. Ms. Mutter begins her Carnegie Hall residency Wednesday, October 1 at 7:00 pm in an opening night gala marking her first United States appearance with the Berlin Philharmonic Orchestra led by Music Director Sir Simon Rattle. She performs Bruch’s Violin Concerto No. 1 as part of a concert that includes Rachmaninoff’s Symphonic Dances and the closing scenes from Stravinsky’s The Firebird. Ms. Mutter first performed with this legendary orchestra at age 13 under the direction of Herbert von Karajan, subsequently launching an international career that has spanned nearly four decades. The concert airs on WQXR 105.9 FM, produced by WQXR and Carnegie Hall and hosted by WQXR’s Jeff Spurgeon. 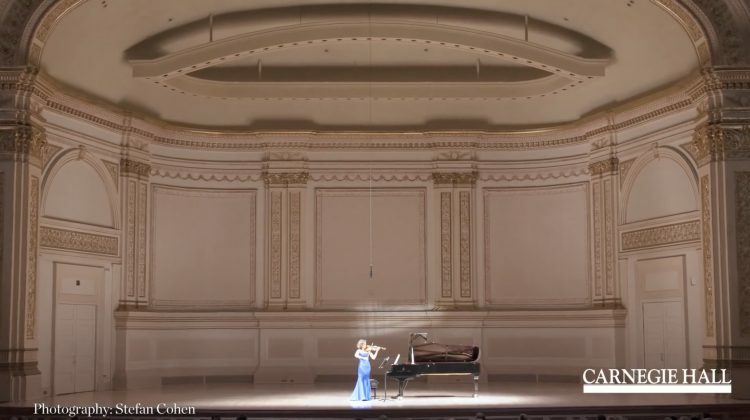 Concerts in the series are available for live streaming on wqxr.org and carnegiehall.org/wqxr. She explains, “Coming to Carnegie Hall with the Berlin Philharmonic Orchestra playing the Bruch Concerto with Sir Simon Rattle is obviously a very important moment because that orchestra is linked so closely with the beginnings of my musical life with Karajan. I have never traveled to America with this orchestra and it somehow feels particularly festive and wonderful.” This reunion comes on the heels of an all-Dvorák album Ms. Mutter recorded with the Berlin Philharmonic, released in October 2013 on the Deutsche Grammophon label. Ms. Mutter is joined by pianist Lambert Orkis Tuesday, November 11 at 8:00 pm in recital at Carnegie Hall. The pair, who celebrated the 25th anniversary of their partnership and the violinist’s Carnegie Hall recital debut in December 2013, commemorated this milestone with a European tour and the release of the two-disc album, The Silver Album, on the Deutsche Grammophon label. The Grammy Award –winning duo have planned an eclectic program for the Perspectives series: Sir André Previn’s Tango Song and Dance (a work written for Ms. Mutter), Franck’s Violin Sonata in A Major, Beethoven’s Violin Sonata No. 9 in A Major, Op. 47, “Kreutzer” and the U.S. premiere of Sebastian Currier’s Ringtone Variations, a work commissioned by the Anne-Sophie Mutter Foundation featuring double bassist Roman Patkoló, a protégé of Ms. Mutter. They play the before unheard "revised version 2014". Also in November, the violinist is proud to lead the first North American tour of Mutter Virtuosi, a string ensemble comprised of 14 current and former scholarship students of the Anne-Sophie Mutter Foundation. For many years, Ms. Mutter has performed with the Foundation scholarship holders introducing them to the life of a professional musician and to a broad audience, while also emphasizing the importance of performing charity concerts for humanitarian causes. Mutter Virtuosi was formed in 2011 for touring projects and benefit concerts with performances of established masterpieces and works by living composers. Following a 2011 European tour and a 2013 Asian tour, Ms. Mutter leads the ensemble in Washington, D.C., Chicago, Toronto, Atlanta, Naples, Kansas City and in New York at Carnegie Hall Tuesday, November 18 at 8:00 pm as part of her Perspectives series. The program comprises the U. S. premiere of Previn’s Violin Concerto No. 2, Bach’s Concerto for Two Violins, Strings and Continuo in D Minor, BWV 1043 as well as Vivaldi’s Four Seasons. Following its North American tour, the Mutter Virtuosi travels to Worms, Germany for a concert benefitting the Lebenshielfe organization for the mentally disabled. Previous benefit concerts given by the ensemble have supported the Hanna and Paul Gräb Foundation for the handicapped and the Swiss Multiple Sclerosis Association. Pianist Yefim Bronfman and cellist Lynn Harrell join Ms. Mutter as the Mutter-Bronfman-Harrell Trio on Tuesday, April 14 at 8:00 pm performing Beethoven’s Piano Trio in B-flat Major, Op. 97, “Archduke” and Tchaikovsky’s Piano Trio in A Minor, Opus 50. The Trio also tours Montreal and the California cities of Northridge, Santa Barbara, Costa Mesa and Sonoma throughout the month of April. As further testament to Ms. Mutter’s commitment to the future of string playing, she concludes her Perspectives series with Michael Tilson Thomasand his New World Symphony on Tuesday, April 28 at 8:00 pm.Moret’s En rêve, a work written for Ms. Mutter in 1988, receives its New York premiere alongside Berg’s moving Violin Concerto, Schubert’s Incidental Music from Rosamunde and ending with Debussy’s La mer.